The Triathlon Bike Rack is a family of products, developed for the event bicycle racking needs of multisport transition areas. These racks are a highly versatile, portable, and sturdy racking system. Bicycles can be racked by the saddle or handlebars. This event bike rack system is superior to other rack systems in its ability to be easily transported, stored, and assembled. The sturdy racks are lightweight and designed so that the legs of the rack fit inside the main beam. This allows for ease in transport and storage. No tools are needed for assembly at the event site. 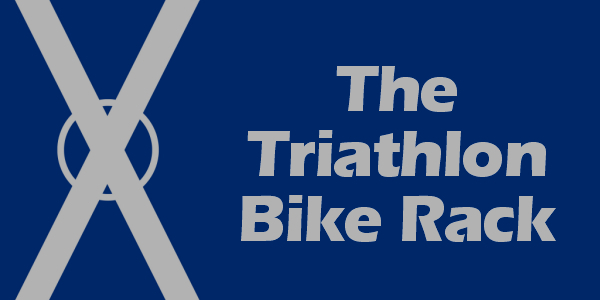 Whether it is a triathlon, duathlon, other multisport event, bike shop display, bike valet service, bike check, special event, temporary bike parking, or triathlon transition practice, the Triathlon Bike Rack is a great solution to your racking needs. Online ordering is currently only available for the TBR-X, TBR-K, TBR-KD, TBR-KBC, and TBR-KB, to a continental US address. Click on the "Buy Now" button on the right side of the below table to order. Please email us for a quote, freight/shipping cost, ordering and payment information for the TBR-8, TBR-8D, TBR-6, TBR-6D, or for any order shipping to non-continental US address. When contacting us, please include the rack type/model, number to order, and adddress for delivery. Thank you for your interest and we look forward to meeting your racking needs. Please contact us for rack pricing and freight/delivery quote.